On previous pages, we talked about the characters and types of opal. It might be a little far from reality, but let's talk about romantic stories of the opal. The opal comes up in the history from the time of the Roman Empire. At that time Roman imperial families and generals loved opals very much. This is a very popular story. The story goes like this. One of the famous generals during The Roman Empire "Marcus Antonius (82-30BC)" was going to give a beautiful opal to Cleopatra. But that stone was owned by Nonius (Roman politician) and he denied to sell the stone to Antonius. The conclusion of this story was Antonius got angry with Nonius and banished him out of Rome. Like this story, the opal has been a favorable gem for Imperials and Royals of European countries. Among these royal families, Queen Victoria of England loved this precious gem and always wore opal jewelleries. Because Australia has been the colony of England, English Royal family owns many high quality opals now. Most popular way of cutting opal is called "Cabochon" which has round dome shape, but sometimes you find irregular shape opals, (free shape) like Boulder Opal. And also sometimes you can find a Brilliant cut like a diamond for Mexican Opals (often found in opals with no play of colour). For valuing the opal, the degree of brightness and colour are important factors. 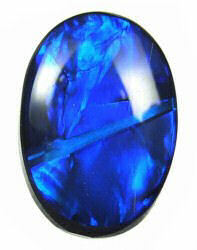 A dull stone with many colours will be less valuable than an opal with single, vibrant colour. More colours in opal is more valuable. Especially for Black Opal, the colours with red or rainbow the most valuable, followed by orange, yellow, green, blue and violet. This is because red is the rarest colour you can find in Black Opal and violet is easiest. The third point is, the patterns of colour. Broad or large patterns are more valuable than small types of pattern. One of these gems is three times more value from than the other gem. Can you find out which stone is more valuable ? We think it's easy for you to find out because you've read through previous chapters. Yes, of course the right opal is more valuable than left. 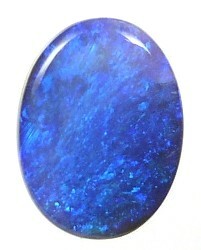 The right opal has more strong and large pattern of colours. If we could show you the actual opal, it's easier for you to understand. We will talk about colour patterns in ADVANCED too. We have just talked about colours and patterns of opal. The last factor is the size. The larger piece opal is more valuable like other gems, but we have to be careful about the size of Black and Boulder opal. Because they have different backings. If you are the opal miner or cutter of opals, you can put more weight on the stone by leaving more backings. The opal traders, like us, usually measure the opal by carat (one carat equals to 0.2g in weight), but also the actual size in millimetres of the stone is important too. We conclude this chapter with soft and romantic stories. The Opal is a birthstone for the month of October and the gemstone representing the 14th and 18th wedding anniversaries. In ancient times, opals was recognized as a symbol of faithfulness and confidence. The brilliant coloured opal was said to have magic powers because of its play of colour. It was known to strengthen eyesight, protect against contagious diseases, ease sadness and turn pale in the presence of poison. Opal symbolizes magic, love, hope, happiness and truth.